I know this sounds like a bad sales pitch, but I have nothing to sell and this really is true. Over 95% of parents are doing something that has long standing negative implications for their entire family. When you are a new parent, it’s hard to have to think through every decision, particularly when it seems to work for everyone else. This week’s video shares this unfortunately common misstep. I will show you how to not just follow the herd and instead support your family to thrive. I know this sounds like an infomercial trying to sell you knives, but what I want to tell you today is actually quite real. 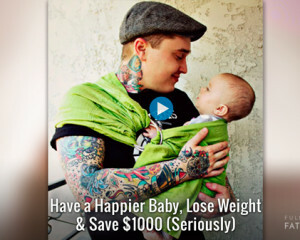 There is one thing that you can do that will help you return to your pre-pregnancy weight, save as much as $1,000 and help your child to be happier in the world. It is actually a truly radical idea that a small number of parents are doing. The one thing that you can do is to not have a stroller. I know that sounds crazy, but it really does drastically alter the dynamic of your family for the better. If you do not have a stroller, then you are likely to carry your kid. If you are carrying your kid, then you are likely to burn off more calories. I am deeply supportive of women embracing the fact that their bodies change so radically during pregnancy and countering the pressures that say they need to lose the “baby weight” right away, but getting exercise is obviously beneficial on many levels. So if you want to start feeling physically fit and active again, carrying your baby makes a huge difference. Obviously not buying a stroller saves a lot of money from a few hundred to a couple thousand dollars. In fact you might be able to buy a smaller car and save a lot of money because you do not have to fit the stroller in the trunk. Most importantly wearing your child supports them to be happier. If you do not have a stroller, then your child is on you a lot more of the time. Children that are held by their parents for a large amount of the day actually cry and whine less, and many studies have shown that they go on to be happier in life. Counter-intuitively, they also end up being more independent and confident. All because they have a really strong, good connection with their parents. When your child comes out of the womb, she is used to being completely contained in the perfect environment. Then they often spend too much of the time in a stroller or car seat where they feel separate and alone. If they have that good attachment of being carried most of the time, then they will feel good in themselves and safer in the world. They have less to cry about and more to feel good about. That good sense in their body allows them to be adventurous and explore their environments, always knowing they can easily return to our loving embrace. If they are alone in a stroller or car seat a lot of the time, they have less chance for that sense of goodness to develop within themselves. You can read more about the benefits of staying in close physical contact with your child at this website. Another great benefit to your child is that once she starts walking, she will be more inclined to walk if she doesn’t have the option of being chauffeured around in the stroller. And of course exercise is very beneficial to their physical and mental health. Obviously if your child is crying less, you are enjoying the feeling of having a strong body and you have more money in the bank, you will be happier too. All from not getting a stroller. My wife and I had a used stroller that sat in the garage, but it was only the grandparents that used it. Mainly we found the real joy in carrying our daughter around everywhere that we went. Yeah, there were many times where I thought, “Oh, I can’t possibly carry her once she gets a little heavier.” But my muscles grew bigger as she grew bigger and I was really able to maintain that level of contact. It all works together as you develop with them. Having products, like the ErgoBaby carrier and the Moby Wrap, really assist in this process. Both these products hold the child really close to you so you can go about your life, do the dishes, go grocery shopping or walk in the park. All while they are right there on you in a very comfortable fashion. Of course the traditional baby sling is also very helpful and easy to use. All of these require a little bit of getting used to it, but it is not harder than figuring out how to put the stroller together and get it in the back of your car. I invite you to take this remarkably radical step and leave the stroller out of the equation. See if you can build a life where it is just you, the family and the baby. Thank you for joining me. I would love to hear your thoughts. Please join the conversation below and I will see you next time.